Dreams. Goals. Plans. Kauai. Travel. Life. A shrine adorns a building at the end of our little street. To be honest, Florence has felt a bit overwhelming at times, but in a good way. There is so much to see and do here, so much beauty, and it can be almost difficult to choose what to do or where to go at times. Both Brett and I are feeling very grateful that we are here for a month versus just a few days. For the past few days all we’ve pretty much done is walk around and look at things from the outside. We started the day yesterday with a walk to the train station to purchase tickets for an overnight visit to the Cinque Terre next week. We had initially thought to go all the way to Monterosso al Mare, at the top, but instead just bought tickets to Riomaggiore, the village closest to Florence. The weather is predicted to be less than good next week, and we may end up needing to buy a round trip ticket from Riomaggiore up to Monterosso, and then riding the train back down to visit each village versus being able to hike between the villages as we hope to do (we’re staying overnight in Manarolo). 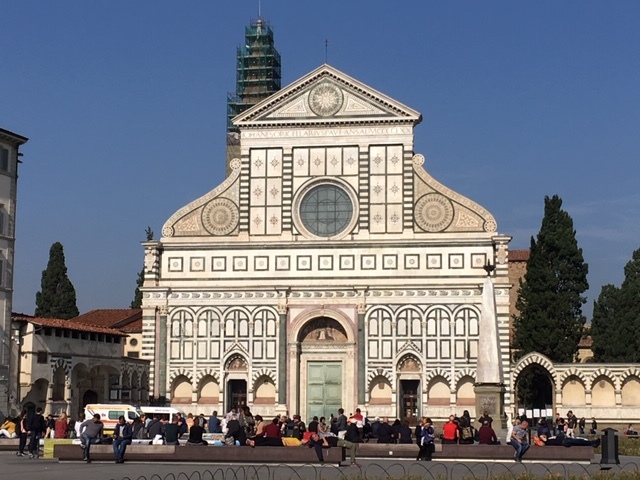 The front of Santa Maria Novella, from the piazza. 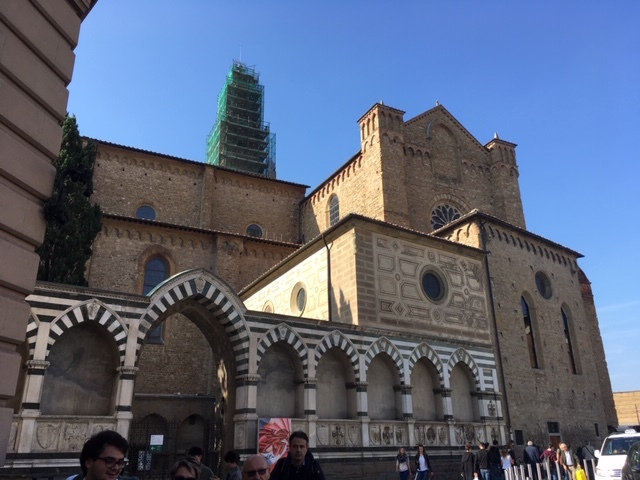 Afterward we bought our tickets we walked around the beautiful Santa Maria Novella church and square, and then went over to see Santa Maria del Fiore. We walked around the Duomo with our mouths wide open, but lines to go inside literally wrapped around the building so we decided to face those another day. I would love to go up inside into the dome, but my knee won’t allow it (I could go up but would never make it down), so that’s something Brett will do on his own one day while I maybe do some other sightseeing or shopping. I had always thought from pictures the exterior was black stone with white, so was pleasantly surprised to see the beautiful deep green stone instead. 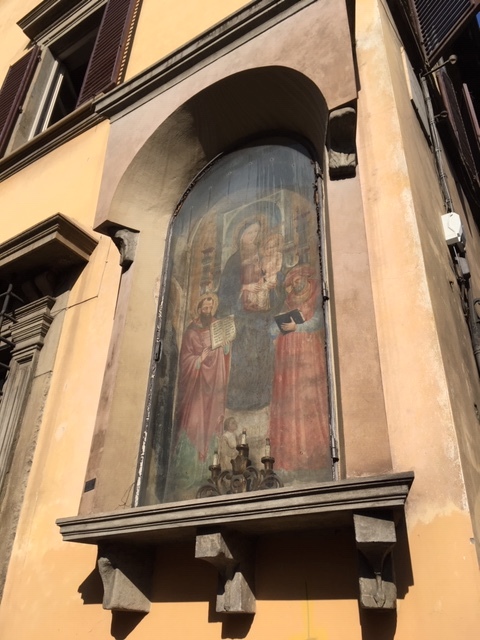 Today we walked down the street to view the frescoes at the Brancacci Chapel (which were breathtaking), then shared a pizza. We wanted to visit the Boboli Gardens but dark clouds rolled in and it began sprinkling, and we did not want to be stuck out in the middle of the gardens if it began to rain any harder. We instead walked down close to the Ponte Vecchio and then turned down a side street to check out a gelato shop. The owner of the shop was born in China, but has lived in Florence for 21 years, and we had a lovely conversation with him while we enjoyed his wonderful gelato. After that we headed back to the apartment with a stop at a small produce shop for a head of broccoli and some pears to go with dinner tonight. We plan to make day trips to both San Gimignano and Siena in the next couple of weeks, and have to figure when to fit those in as well as visits to the Uffizi and Accademia museums, where tickets will need to be purchased in advance. We learned today though at the gelateria that all museums will be open for free on November 4, so we’re thinking we’ll get up early that day and walk over to visit the Accademia (supposedly the lines won’t be very long this time of year). As far as dining we want to go out for bistecca fiorentina one evening, have antipasti and risotto for lunch at least once, and have a few more pizza (pasta I can fix at the apartment). We have only one other definite thing on our calendar now though, a pizza class a few days before departing for Rome. We had a coupon from Airbnb to use toward an experience, and after going over all of the ones offered here in Florence we decided learning to make (and eat) pizza sounded like the most fun. Brett already makes a pretty good pie, but he’s hoping to pick up a few tricks and techniques to up his game. This weather this weekend is predicted to be stormy, so we’re thinking of maybe going to the Mercado Centrale on Saturday or visiting the Palazzo Pitti, and then just staying in on Sunday to read and plan future outings. We accidentally discovered the Sts. Michel et Gaetan church, with its facade covered with beautiful statuary, when we went down the wrong street. 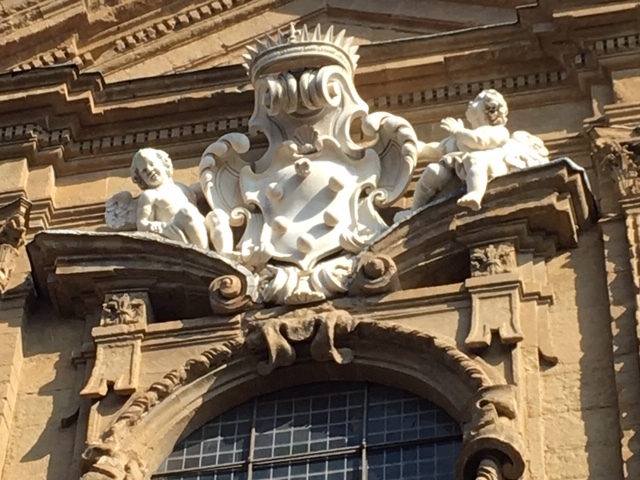 Two happy cherubs adorn the top of the church. The interior is supposed to be quite spectacular. Florence truly is an embarrassment of riches. It’s almost unbelievable to have so many choices of what to do and see each day. I was going to answer the question in your title with “eat gelato!” but I see you found that solution. The one time we were in Florence long ago with 8 and 20 year old sons we kept circling back to grab more gelato. It was hot and amazing. We’re going to try and eat some from a different place every day (although we may have to go back to the place we tried today – yummy flavors)! When asked where I would love to return- this city is in my top three. I have thought a great deal about spending an entire month in Florence and Rome. Thank you for refreshing my memories. We’ve been here just five days and are already glad we will be here for a month! We try to do or see something special each day, and hopefully when it’s time to move on we will feel satisfied with all that we did see and do. Right now though we just want more, more, more – Florence is an amazing place! Florence truly is an amazing place, and the more we see and do the more we want to see and do. I really don’t know how to explain it – each door seems to open another. So glad we are here for a month! We are sitting here in Kyoto, eating breakfast and reading your blog, waiting to head to the airport for our flight home. 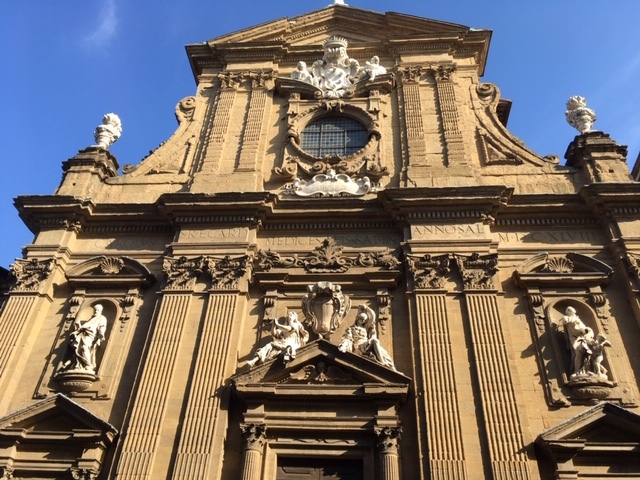 After this post, I told my husband I was finally in agreement that a month in Florence was now a definite ‘Go’ for me as well. He says, ‘Thank You’ for tipping me over to his side! I am interested in knowing whether you plan to rent a car at some point, or if you think public transportation can get you everywhere you wish to go in the Florence/Tuscany region? I have loved all your Japan pictures – you really did get to see the highlights, and at a beautiful time of the year (I actually prefer fall there to the spring and cherry blossoms, although that’s when we’ll be there next year). We have no plans to rent a car here – it seems as if everything is doable by public transportation. When we arrived our taxi driver said it’s extremely difficult to drive in the city, and our host said it’s nearly impossible to have a place to park. I could see using a scooter to get around town, but we’re finding that every place in town is easily walkable from our location in the Oltrarno neighborhood, at least so far. We will use trains/buses to get to sites outside of the city (we’re just a 10 minute walk from the train station). I could see using a car to go into the countryside, but even then where would you keep the car? Is there parking at the places you want to visit? Probably yes, but it just seems to be another level of stress that we didn’t want to add to our stay. Every day we’re here I’m glad we booked for a month – plenty of time to see everything, or at least the things we want to see and not feel pressured. Plus, we get 30 days of gelato! I love the feature of the photos in the slideshow! I’ve never thought of travelling to Florence until reading this. It looks so beautiful! Florence is wonderful – I am so glad we came here, and that we’ve given ourselves lots of time to explore. Even a walk down a side street is fun – you never know what you will see or find. The slideshow feature in WordPress is a great way to incorporate lots of similar pictures in one frame rather than have readers scroll through picture after picture after picture, etc. It’s fairly easy to set up too, more time consuming than anything. I’m sure as I go along and if I consistently post on my blog I will learn these things too….or at least I can hope for that haha! I just LOVE this post. Florence was one of our very favorite spots, and your pictures bring back so many wonderful memories. We did climb the Duomo and halfway up we were out on a terrace when a fellow tour member from Canada checked his phone and told me Paul Manafort had turned himself into the FBI. LOL. Mostly, we were able to escape the news for our trip, though. We bought skip the line tickets and that was one expense I didn’t regret. You’re so right…SO much to see there. The marble facades are all more beautiful than the next and the gelato is To. Die. For. Black sesame! Actually, if there is any bad food in Italy, we didn’t find it. 🙂 I would go back in a heartbeat. Brett is greatly looking forward to going up in the Duomo, although he’ll arrange that after we visit the Cinque Terre this coming week. I plan to tour the inside of the Duomo and do one bit of shopping nearby while he’s climbing. We discovered we can buy combined tickets for the Uffizi, the Boboli Gardens and the Pitti Palace at the Palace, so we are going to try for a free entrance to the Accademia on 11/4, then the Palace on the 5th, the Gardens on the 6th, and the Uffizi on the 7th. And then we will rest for a day or two!! I have been pretty much able to avoid U.S. politics while we’ve been here, although I do check in with one blog that keeps me somewhat up-to-date (and has good discussions to follow if I want). Probably no gelato today as a)lots of places are closed because it’s Sunday, and b) it’s raining and we’re staying home to rest. We are already becoming “gelato snobs” – we pass by the shops that have the “basic flavors” and search for places with more unusual ones, like the black sesame. Wow, what beautiful photos! I like the slideshow feature. I’ve been to Florence twice but both trips were very brief and I didn’t get to see a lot of the places you’ve already been to. I had pizza in many other cities in Italy and didn’t care for it, but the pizza in Florence was the best. Enjoy! We are in deep love already with the pizza here. There’s a restaurant down the street that has four pages of pizza choices, and watching the pizzaiolo make our pies was like watching an artist. We’ve been sort of glad for the past couple of days of storms for the chance to relax and catch our breath. We thought we might get out today (Monday) but the sky cleared just long enough for us to dash to the market and into the neighborhood gelateria. We’ll be out again tomorrow – we’re going hunting for Dante’s house. Slow traveling the world with Airbnb, forty-four pounds in our suitcases, two full backpacks, and a sense of adventure! It’s the dogwoods’ turn to show off. I love everything matcha but this was a first: a matcha bagel with white chocolate chips. Tasty! Grieving today for all that was lost, but thankful for all that was saved.